The Quebec Liberals have defended their new bill that is widely known as the back to work bill. Many people are saying that the new law gives to much power to the provincial government on the matters of negotiations between unions, and private sector construction companies. The legislators debated for a decently long time throughout the evening and even passed a law to force the construction workers that are on strike to go back to work. The law covers workers in the manner of pay. It gives workers a 1.8 percent pay hike. The law goes as far as to force both sides to enter a 5 month-long mediation period, then an arbitration period, if no deal is reached. The unions do not like the law considering they said that their lawyers are currently preparing to challenge the law. They claim that the government may have illegally limited their strike time. An association that represents the workers mentioned that the workers got a good side of a deal this time because they don't lose anything in the return for their pay raise. The government is largely being criticized because the law gives them the power to decide what factors are being decided by arbitration period as well as what subjects are not included in the period. One politician known as Jean-Francois Linsee called the law "anti-worker" and called the overall law into question. This is possibly just one of many situations like this to come. Eric Cote is a spokesperson for the association representing private sector construction companies. He said what is subject to arbitration "can be motivated or subject to political pressure." said Eric Cote. A coalition of unions said that the law "muzzles" the workers. However, this was just a news release as their representatives were not available at the time. 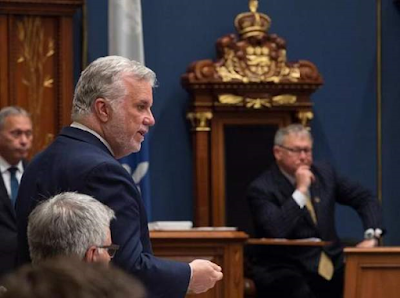 The Premier of Quebec, Philippe Couillard responded by saying that the government is willing to consult with all parties before any potential arbitration period actually begins.